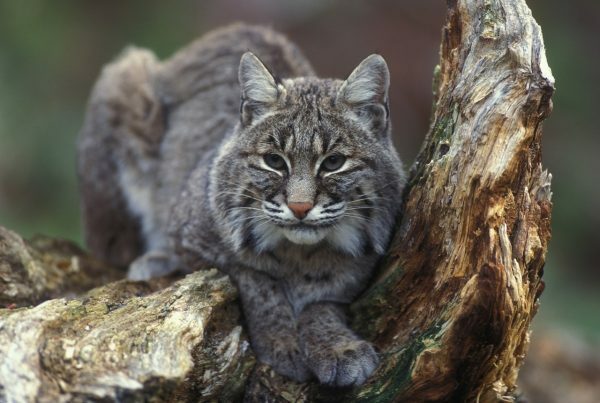 Bobcats are elusive loners – tough to locate and even tougher to shoot, which is why using a good calling technique can make the difference between success and a frustrating day in the woods. With preparation and attention to detail, you can improve your calling skills and increase your odds of bagging a bobcat this season. Before you begin calling, it is essential to find and area to hunt that has clear signs of bobcat activity. A bobcat will use the same trails again and again, throughout its territory, so if you find a trail and other signs, such as fresh feces or indications of a kill, you know a bobcat is in the area and the odds are good it will return to that same location. Once you identify an area where a bobcat is active, you need to find a place to hunt. Ideally this is on a hill or rise, or in a stand, so you can see the bobcat when it approaches. Good cover, such as a large tree or brush is also helpful in keeping yourself hidden from the bobcat. It is important to remember that bobcats are opportunists. Wherever they can find an easy meal, they will take it. And they will eat a wide range of prey, from rodents to birds. Keeping this in mind, there are a wide range of calls that will attract a bobcat to your locations. Among the most popular is the cottontail call, but bird calls can also work. Any type of call will work from a reed call to an electronic one. If you are making some type of distress call, a bobcat is likely to get curious and move toward it. However, an electronic call is the best choice, because it allows you to keep calling while taking aim at the animal, not to mention, it will not wear out your lungs, with the length of time it can take to call a bobcat toward you. One of the biggest mistakes hunters make when calling bobcats is giving up too soon. It often takes a healthy dose of calling to catch the interest of a bobcat. Often, it takes as much as 30 minutes to an hour of continuous calling to bring a bobcat to your location. This seems like a long time, but if you quit after only 15 or 20 minutes of calling, you are likely making a critical mistake. One important technique in calling bobcats is to begin your calling with a low volume, in case the cat is nearby. If you receive no response, gradually increase your volume to reach greater distances. You can also try changing your calls if one is not working. One call might be more attractive than another. While you are calling, it is important to stay still, because bobcats have exceptional eyesight and can detect the slightest movement from a hunter. At the same time, it is important to stay alert and to continually scan the terrain for an approaching bobcat. It is important to note that bobcats approach their prey very slowly, while crouched low to the ground, so it can be difficult to spot them. If you see a bobcat approaching continue calling to draw them closer and get the best possible shot.